Potatoes are versatile little things and fit right into the heart of many stir fry recipes! 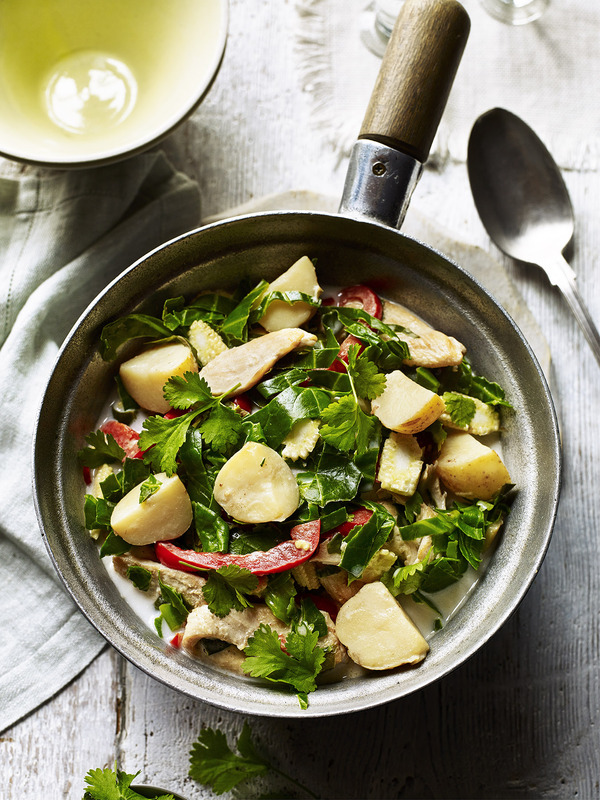 This particular method finds the potato mingling with the likes of chicken and classic Thai recipe ingredients including ginger, spring greens, coconut milk and sesame oil. Check out the delicious method below! Cook the potatoes in salted boiling water for 6-7 minutes until tender, drain. In a wok fry heat, the oils, add the chicken and cook until nicely sealed, add the ginger, Potatoes, red pepper and baby corns and continue frying for a couple more minutes. Pour in the coconut milk, water, lime juice and bring to a simmer. Add a little salt and milled pepper to your taste. Finally add the spring greens and once they have wilted serve in a bowl topped with coriander. If you like a little kick to your broth feel free to add some chilli. View the video for this recipe below and discover more potato recipe videos here.